It has been said that "if exercise could be packaged in a pill, it would be the single most prescribed and beneficial medicine in the nation." Now, new research, published in Experimental Physiology by researchers from the University of Glasgow, has highlighted several of the positive health effects of a short duration, high-intensity resistance exercise training programme in overweight men. The findings of this study suggest that a six week programme consisting of three 15 minute sessions per week dramatically improves insulin sensitivity, as well as muscle size and strength in this population. The authors hope that with further work, these results can be shown to apply to individuals with Type II diabetes, of whom 90% are overweight or obese. Their findings show that short-duration bouts of exercise to exhaustion are just as effective in improving insulin sensitivity (how sensitive the body is to the effects of the hormone, insulin) as longer duration (45 minute) resistance exercise sessions. Such short sessions might be more appealing and attainable in a world where time is a frequently cited barrier to physical activity. Insulin sensitivity describes how sensitive the body is to the effects of the hormone, insulin. This hormone is responsible for the uptake of sugars from our blood to our tissues for storage or to use as energy. When insulin sensitivity decreases (as in Type II diabetes), blood sugars rise, which in the short-term can lead to feelings of fatigue, but over time is related to complications including heart disease and stroke. 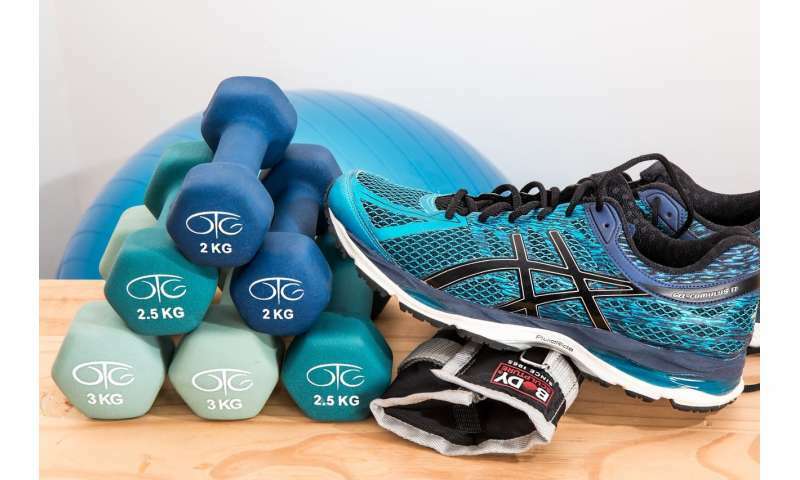 Previous research had suggested 45 minutes of resistance training with multiple sets of each exercise could increase insulin sensitivity, muscle size and muscle strength, but no studies had tested the efficacy of shorter exercise resistance exercise programmes. To test this theory, the research team recruited ten overweight men (as distinguished by a Body Mass Index of 25-30), who trained three times a week for six weeks. Each training session involved a single set of nine standard resistance exercises such as leg presses and bicep curls, performed at 80% of their maximum single repetition lift until volitional failure (i.e. when a further repetition could not be completed). Muscle size, muscle strength and insulin sensitivity were measured before and after the training period. Comparisons of these measurements revealed that insulin sensitivity increased by 16% following the exercise regimen. Indeed, muscle size and strength, were measurably increased after only two weeks of training, with these variables continuing to increase progressively throughout the remainder of the study. These results are exciting and add weight to the notion that muscle strengthening activities should be performed regularly. They also validate the protocol employed in this study as a time efficient way to do this. However, it should be noted that all participants were men and relatively healthy (despite being overweight) and the study did not have a control arm. As such, other populations will need to be studied in a large randomised controlled trial to confirm the observed effects of this study. It would clearly be heartening should similar results be observed in diabetics, given that the overall costs of the condition in the UK are forecast to reach £40 billion annually by 2035/36. Stuart Gray, who led the research group, is already thinking of other ways to build on his team's work: "On top of these results, we know that the gym is not for everyone. Therefore, we also need to see if we can get people doing similar exercises at home without gym equipment, to achieve similarly beneficial effects." Shoveling snow is a great resistance exercise. The lift and toss at the end of each push row is as good as kettlebells. Watch your heart rate. "Shoveling snow is a great resistance exercise. The lift and toss at the end of each push row is as good as kettlebells. Watch your heart rate." -Actually no, shoveling puts unnatural asymmetric strain on your bones and joints and can cause heart attacks and also aggravate autoimmune problems. Work is not the same as working out.